UM alumnus and former band member Sumner Spradling has made the lead gift that will help begin construction of a new director’s tower that will bear his name. 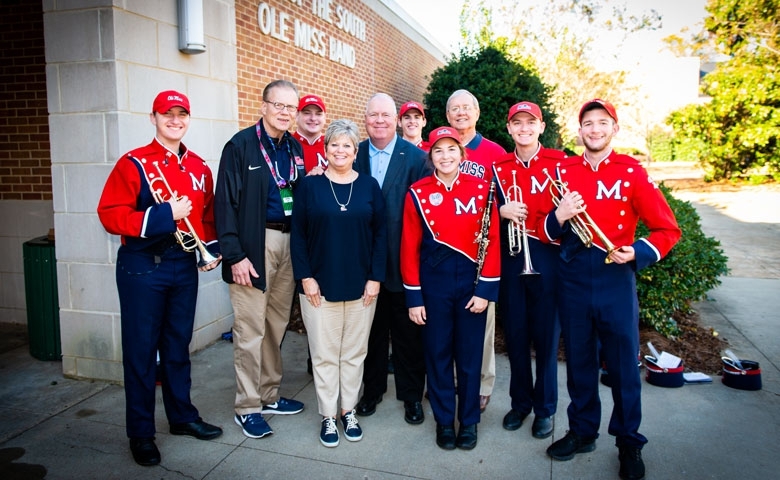 Pictured are (from left) Matt Louis of Corinth, Mississippi, Ole Miss band director David Willson, Matt Smith of Flowood, Mississippi, donors Risa and Sumner Spradling, Wil Stacy of Southaven, Mississippi, Francena Sekul of Biloxi, Mississippi, UM development officer Ron Wilson, Richard Springer of Biloxi, and Max Warren of Ocean Springs, Mississippi. A gift to the University of Mississippi is expected to help take the Ole Miss band program to a new level — literally. Sumner Spradling of Greensboro, North Carolina, recently gave the university $100,000 to establish the Band Director’s Tower Fund, an account designed to support the construction of a new director’s stand overlooking the practice field of the “Pride of the South,” UM’s acclaimed marching band. “I hope the tower will enable the band director and staff to observe the marching band in a safe environment while also helping to move Ole Miss practice facilities into a competitive position,” said Spradling, a Clarksdale, Mississippi, native who graduated from Ole Miss in 1975 with a bachelor’s degree in music education; he later earned a master’s degree in music education from the University of South Carolina. Because of his lead gift, the tower will bear Spradling’s name. Spradling chose to attend Ole Miss after meeting the-then band director Luther Snavely. During his time at Ole Miss, Spradling focused on earning top grades, often taking in excess of 20 hours a semester while also managing to practice, attend rehearsal, work part time in the music library and become active with a number of campus and honorary organizations, including Phi Mu Alpha, Kappa Kappa Psi and Phi Kappa Phi. After graduating from Ole Miss and spending six years as a band director in Sumter, South Carolina, and at Southwest Baptist University in Bolivar, Missouri, Spradling returned to Mississippi to help with the family business. His father founded Infolab, Inc. in Coahoma County, Mississippi, which became one of the nation’s largest regional medical-supply distribution centers, covering 22 states. Upon his father’s death, Spradling became president, managing the company for three years until 2012, when Infolab merged with a larger company. He has always kept his interest in playing music. Spradling and his wife Risa have two adult sons, Jason and Carter, who live nearby with their families. He enjoys spending time with his grandchildren as well as farming, hunting, golfing and time at the beach. He remains active in his church and serves as principle trumpet in one of the local symphonies. He also plays in a swing band in Danville, Virginia. Ron Wilson, the band’s development officer, said that up to $100,000 more is needed to fully cover the tower’s construction costs. The Sumner Spradling Band Director’s Tower Fund is open to gifts from individuals and organizations. To contribute, send checks with the endowment name noted in the memo line to the University of Mississippi Foundation, 406 University Ave., Oxford, MS 38655; or visit www.umfoundation.com/makeagift. For information on supporting the Pride of the South, contact Ron Wilson, development officer for the College of Liberal Arts, at 662-915-1755 or jrwilso3@olemiss.edu.